Zion Market Research has published a new report titled “3D Printing Medical Devices Market by Components (System, Materials, and Software & Services), by Technology (3D printing, Droplet deposition, Photopolymerization, Laser beam melting, Electron beam melting (EBM), Laminated object manufacturing (LOM), and Others), by Application (External wearable devices, Clinical study devices, Implants, and Tissue engineering), by End-User (Medical and surgical centers, Pharma and biotech companies, and Academic institutions): Global Industry Perspective, Comprehensive Analysis and Forecast, 2017 – 2024”. 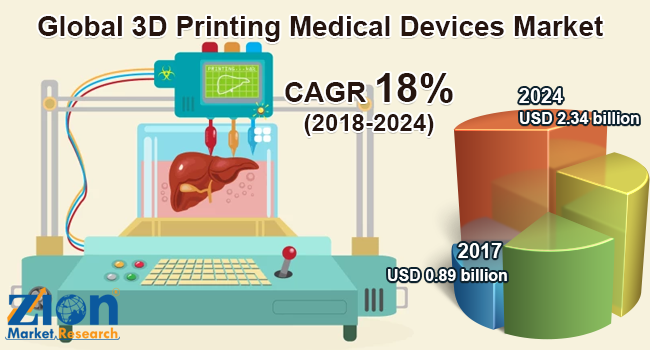 According to the report, global 3D printing medical devices market was valued at approximately USD 0.89 billion in 2017 and is expected to generate revenue of around USD 2.34 billion by the end of 2024, growing at a CAGR of around 18% between 2018 and 2024. 3D printings have huge potential in medical devices and other products, including food, household items, and automotive parts due to its capabilities. 3D printing technology helps in titanium replacements for hips & jaws, the creation of limb prosthetics and plastic tracheal splints, etc. Due to the advanced technology and easy to develop 3D printing devices many doctors prefer 3D printing before surgeries of any organ part which reduces error. 3D objects formed from a digital 3D files is a computer-aided design drawing or a Magnetic Resonance Image. In this process, a 3D object is created by constructing consecutive layers of material. Each layer is attached to the prior layer until the object is complete. The global 3D printing medical devices market is primarily driven by growing technological advancements in 3D printing. Growing public-private funding, easy development of customized medical products, and a number of applications of 3D printing in the healthcare industry are majorly contributing to the growth of the market. Another factor driving the 3D printing medical devices market is the significant benefit of cost savings, which majorly account to the growth of the market. However, the stringent regulatory process of 3D-printed medical devices and copyright & patent infringement concerns can create restraints to the 3D printing medical devices market. Additionally, biocompatibility issues associated with 3D printed medical devices and limited technical expertise may limit the growth of the market. The 3D printing in medical devices is segmented on the basis of the component type including system, materials, and software & services. On the basis of technology, 3D printing medical devices market is segmented into 3D printing, droplet deposition, photopolymerization, electron beam melting (EBM), laser beam melting, laminated object manufacturing (LOM), and others (ColorJet printing, MultiJet printing). On the basis of application, 3D printing medical devices market is segmented into external wearable devices, clinical study devices, implants, and tissue engineering. To enhance the aesthetic beauty and growth in preference for minimally invasive procedures there is an increase in demand for the 3D printing medical devices market. By end user, the market is divided into medical & surgical centers, pharma & biotech companies, and academic institutions. North America, Europe, Asia Pacific, Latin America, and the Middle East & Africa are major regional segments of the global 3D printing medical devices market. North America is projected to dominate the global 3D printing medical devices market. Presence of developed healthcare infrastructure and major players of 3D printing medical devices in the region are the key factors responsible for the large share Europe also has an immense potential for expansion, due to the growing geriatric population and surge in a number of facial procedures. Asia Pacific is also expected to expand at a considerable large rate, displaying a promising CAGR during the forecast period. Some of the key players in the 3D printing medical devices market are 3D Systems Corporation, EnvisionTec, Stratasys Ltd., Arcam AB, Organovo Holdings, Inc., Bio3D Technologies, Oxford Performance Materials Inc., Materialise NV, Cyfuse Biomedical K.K., and SLM Solutions Group AG, among others.